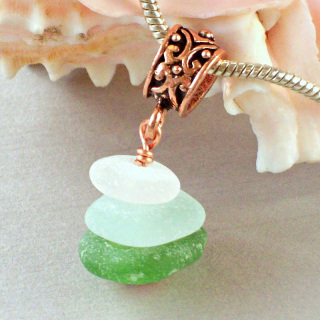 Three pieces of natural sea glass are stacked to form this sea glass charm. Kelly green, Sea foam green and white sea glass. Fits Pandora style charm bracelets. The sea glass is wire wrapped to a large holed antiqued copper charm bead. 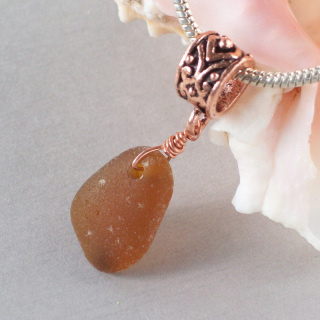 This would look great on a a leather or silver necklace too! Measures about 3/4 inch in length. I have top drilled a well frosted piece of olive green natural sea glass and wire wrapped it to a large holed antiqued copper charm bead. Fits Pandora style charm bracelets. 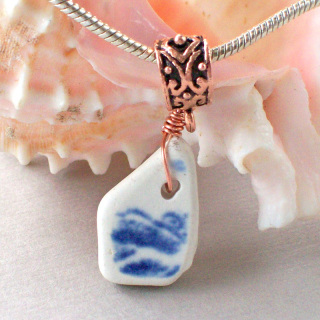 This would look great on a a leather or copper necklace too! Measures about 3/4 inch in length. 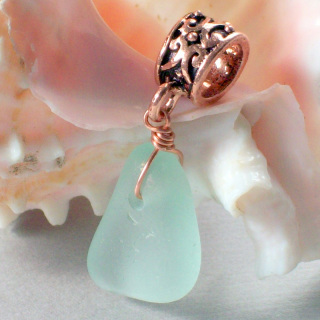 I have top drilled a well frosted piece of pastel sea foam green natural sea glass and wire wrapped it to a large holed antiqued copper charm bead.Fits Pandora style charm bracelets. This would look great on a a leather or copper necklace too! Measures about 3/4 inch in length. I have top drilled a surf tumbled piece o fantique cobalt blue and white pottery from Hawaii and wire wrapped it to a large holed antiqued copper charm bead. Fits Pandora style charm bracelets. 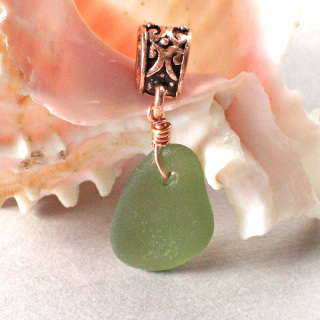 This would look great on a a leather or copper necklace too! Measures about 3/4 inch in length.